Poorly managed migration can lead to harm, danger and insecurity, says a report from the Economist Intelligence Unit. It can encourage migrant smuggling and human trafficking, as well as social unrest, xenophobia and discrimination—as observed amid Europe’s ongoing “migration crisis”. It can also create missed opportunities when receiving and sending countries are blocked from harnessing the development gains available through mobility. Well-governed migration brings profound benefits to both “receiving” and “sending” countries. Receiving countries get productive workers who fill key gaps in the labour market and help their demographic profiles. Sending countries receive billions of dollars in remittances from their overseas workers, attract investment from affluent members of their diaspora, and leverage the benefits of “circular migration” when returning emigrants bring back their skills, expertise, contacts and personal wealth. Text courtesy of Migrants’ Rights Network – Poorly managed migration harmful says report. A new study by Ipsos MORI looking at how British attitudes towards immigration have changed over the long term and during election campaigns is published today. The report, “Shifting Ground”, combines existing data with new findings from a longitudinal study which followed voters during, throughout, and after the 2015 General Election campaign in order to track changes in individuals’ attitudes. The study finds concerns about immigration have indisputably risen over the long term. The importance of immigration as an issue facing Britain on the Economist/Ipsos MORI Issues Index reached record levels in 2015, with 56% of the public mentioning it in September; the highest level ever recorded since the series started in the 1970s. As well as growing concern overall, there were changes in the profile of people who are concerned about the issue. In particular, in the early 2000s there was relatively little difference between the oldest and youngest generations on concern about immigration, but in the last few years there is a growing generational divide with older generations having become much more concerned than younger generations. Read Full Article: Shifting Ground: Views on immigration during the long term and during election campaigns. Today (16 May) marks the launch of a new academic report by the Open University, Mapping Refugee Media Journeys: Smart Phones and Social Media Networks. The research identified a huge gap in the provision of relevant, reliable and timely news and information for and with refugees that is endangering their lives. “Our research suggests that the information and news needs of refugees are not sufficiently taken into account by governments and news organisation as they make perilous journeys from war-torn parts of the world to Europe and when they arrive. EU member states have failed to develop a coherent policy strategy to deal with refugees entering Europe,” said Marie Gillespie, OU Professor of Sociology and a member of the OU’s Citizenship and Governance priority research area. The research uses an innovative mix of methods: serial interviews with Syrian and Iraqi refugees as they make their journeys, an analysis of news media coverage of refugees and a ‘big data’ analysis of refugee social networks on Facebook and Twitter by computer scientists. It involves interviews with staff at the European Commission, among international broadcasters and non-governmental organisations (NGOs). It provides a best practice guide for those providing digital resources for refugees. The report reveals that refugees access the news and information they need through their mobile phones mainly via links sent by trusted friends and family, as well as by smugglers. The smartphone is both a resource and a threat on their journeys. It is an essential navigation, translation and networking tool but it is also a threat as the digital traces refugees leave behind make them vulnerable to surveillance by extremists and smugglers. The smartphones also contain an ever-expanding photo album of violence and abuse that they may have witnessed. The need for security forces refugees to go underground digitally where they use avatars and encrypted services to get vital information from smugglers and handlers whom they have to rely on and sometimes trust more than government sources and mainstream media. Read full press release – OU research highlights benefits and risks of smartphones for refugees. Mapping Refugee Media Journeys: Smart Phones and Social Media Networks was produced by The Open University and France Mèdias Monde. Read more about OU research in Citizenship and Governance. 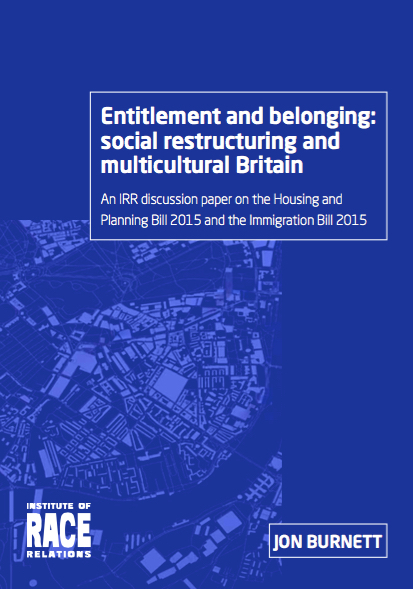 An IRR discussion paper on the Housing and Planning and Immigration Bills 2015-16. The Housing and Planning and Immigration Bills, currently going through parliament, contain measures which are central to the Conservatives’ stated belief in cohesive ‘One Nation’ government. 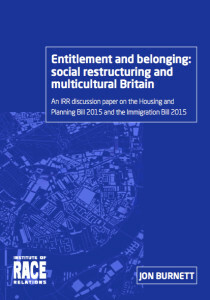 In a discussion paper published by the IRR today, criminologist Dr Jon Burnett argues that the rapid social transformation that will inevitably take place through these mutually-reinforcing housing and immigration measures will be destructive for social cohesion. In fact, the break-up and displacement of multicultural neighbourhoods, coupled with the extended reach of immigration policing, will accentuate extremes of inequality in the inner city and lead to a marked deterioration in the quality of life for BAME communities. Focusing largely on London, Entitlement and belonging suggests that a ‘SUS culture’ is developing in the UK as the ‘hostile environment principle’, long- established in immigration policy, is extended into housing. The government argues that nationally-implemented ‘right to rent’ checks, imposing a duty on landlords to carry out immigration profiling and allowing summary eviction of tenants, are ‘justifiable’ measures aimed at forcing out those who have no legal right to stay in the country. Yet even its own evaluation provided compelling evidence of discrimination against BAME citizens. New publications: ‘EU Asylum Procedures and the Right to an Effective Remedy’; ‘The Reception of Asylum Seekers under International Law’ (discounts available). Adequate and fair asylum procedures are a precondition for the effective exercise of rights granted to asylum applicants, in particular the prohibition of refoulement. In 1999 the EU Member States decided to work towards a Common European Asylum System. In this context the Procedures Directive was adopted in 2005 and recast in 2013. This directive provides for important procedural guarantees for asylum applicants, but also leaves much discretion to the EU Member States to design their own asylum procedures. This book examines the meaning of the EU right to an effective remedy in terms of the legality and interpretation of the Procedures Directive in regard to several key aspects of asylum procedure: the right to remain on the territory of the Member State, the right to be heard, the standard and burden of proof and evidentiary assessment, judicial review and the use of secret evidence. Marcelle Reneman is Assistant Professor in the Migration Law Section of the Department of Constitutional and Administrative Law at the VU University Amsterdam. Some 4 million people were displaced when Typhoon Haiyan hit the central Philippines on November 8th 2013. In spite of the wealth of information generated, it has been difficult to form a coherent understanding of the evolving and complex displacement situation, which is critical to guide policy and prioritize responses on the ground. Six months on, while most displaced people have remained in their original homes areas or returned to them, more than 2 million people are still without adequate housing. This includes over 26,000 displaced people in temporary shelter sites. Many thousands more are unclear on whether they will be permitted to return to live in unsafe locations. This report shows how gaps in the information – and in the way that information is created and shared – leaves some of the most vulnerable people invisible and potentially excluded from sustainable return or relocation and resettlement options. With the next typhoon season just around the corner, the importance of recognizing their particular needs becomes all the more urgent. The International Journal of Transitional Justice recently published an article titled: “Every Day the War Continues in My Body: Examining the ‘Marked’ Body in Postconflict Northern Uganda”. This article, authored by the research coordinator of the Refugee Law Project’s National Memory and Peace Documentation Centre, Theo Hollander, and RLP Research Associate, Bani Gill, is a follow-up project to RLP’s documentary, “Untreated Wounds” (http://refugeelawproject.org/resources/video-documentaries/video/latest/untreated-wounds.html), and also draws from RLP’s work with people living with untreated wounds in northern Uganda. In a nutshell, the article argues that, while human bodies have assumed centre stage in modern warfare, a focus on the body is largely missing in peace processes and transitional justice. The article examines the embodied, gendered and socio-economic features of bodies marked by injuries, wounds, disfigurements and disabilities in the aftermath of the war in northern Uganda. Considering these various features, it becomes clear that for most people whose bodies were marked, the war continues in their bodies, long after the guns fell silent. The article argues that, in the aftermath of armed conflict, where so many bodies have been marked, disability mainstreaming should become a quintessential element in transitional justice, but cautions that this goes beyond medical interventions. While medical interventions, such as those offered by RLP by referral, can make an important impact in the lives of people living with marked bodies, medical interventions on their own are not enough. The challenges, experiences, needs and aspirations of people whose bodies are marked should enter mainstream thinking in transitional justice, meaning that in all transitional justice activities and mechanisms, it should be considered how marked bodies can be included, participate and benefit. The Refugee Law Project, a community out-reach project of the School of Law, Makerere University, was created in 1999 to promote the enjoyment of human rights for all refugees within Uganda. Over the years, the Refugee Law Project has established its reputation as the leading centre for justice and forced migrants in Uganda.